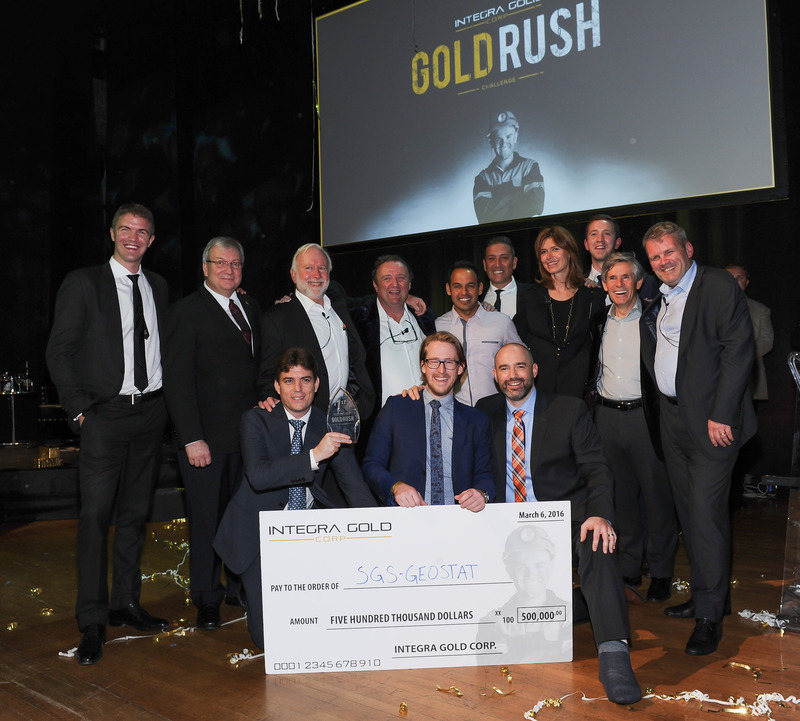 VANCOUVER, BC--(Marketwired - March 07, 2016) - Integra Gold Corp. (TSX VENTURE: ICG) (OTCQX: ICGQF) ("Integra" or the "Company") is thrilled to announce that SGS Geostat team from Québec was awarded first place in the Gold Rush Challenge last night in front of a crowd of 400 at the Gold Rush Challenge Live Finale at the Carlu in Toronto. The SGS Geostat team beat out 4 other finalists and emerged as the winner with their submission that utilized a combination of machine learning and traditional geological methods to produce targets across the Company's Lamaque project in Val-d'Or, Québec. SGS Geostat used sophisticated geostatistical methods to drive data into an expansive and unbiased block model. A prospectivity scoring system harnessed both geological knowledge and machine learning, a subfield of artificial intelligence, to identify high value targets, which were then vetted through Virtual Reality with Oculus Rift technology. The proposal impressed both the technical judges and the Industry Titans that evaluated their presentation in a "shark tank" live finale. As the winner, SGS Geostat was awarded C$500,000. "The Gold Rush Challenge has given Integra a platform to call on governments, mining companies and mining financers to get off the sidelines and get into the game. We are challenging traditional thinking and breaking new ground, embracing disruptive technology that is critical to the mining sector," commented Executive Chairman George Salamis. "The proposal from SGS Geostat represents the disruptive innovation we saw in the Gold Rush Challenge. We saw the tech sector and the mining sector collide and unravel the great mystery of discovery. SGS Geostat beat the odds, advancing out of the semi-final round and impressing the industry titans with their embrace of machine learning and virtual reality while also emphasizing the importance of tradition, data driven geology." "The Gold Rush Challenge exceeded our expectations on every front. It has proven our steadfast commitment to always challenge ourselves to think outside the box to create value for our shareholders," stated Integra President and CEO, Stephen de Jong. "A number of the exploration drill targets identified through the Challenge are like nothing we've ever seen before. We have decided to expedite the drill program and start testing a number of these targets in the immediate future. We thank every one of the participants for stepping up to the Challenge and helping us make it such a great success. Stay tuned for news on the Gold Rush Challenge Program as we continue to work towards making Val-d'Or's next big gold discovery." "We are enormously grateful to Integra Gold and their sponsors for organizing this event. As a team of geologists, engineers, and computer scientists often bound by certain limitations and boundaries, we relished in the opportunity to channel our collective creativity and curiosity to provide new exploration targets in a historic and famous mining jurisdiction known worldwide," noted Guy Desharnais, team captain of SGS Geostat. Team GoldRX, Craig Hart and Sara Jenkins, won the audience choice award. This C$10,000 award was provided by members of the syndicate from Integra's February 2016 financing. The syndicate members also made a matching C$10,000 donation to the local Val-d'Or charities. "These top 5 finalists showed exemplary talent, tabling some highly innovative and ground breaking ideas for the next big gold discoveries at Sigma-Lamaque and beyond. We salute these teams for their phenomenal efforts," commented Steve deJong, CEO and President of Integra Gold. Integra was impressed to see the winning teams from Québec, Canada and across the World. Integra thanks Luc Blanchette, Québec Minister for Mines, Minister responsible for the Abitibi-Témiscamingue region, and Minister responsible for the Nord-du-Québec region for attending the event and giving remarks on behalf of the Government of Québec. Deciding the fate of the five finalists were industry titans Brent Cook, economic geologist and BNN commentator; Chantal Gosselin, director of Silver Wheaton Corp., mining engineer, former resource fund Manager and Val-d'Or local; Rob McEwen, founder of Goldcorp Inc. and McEwen Mining Inc.; Sean Roosen, Chairman & CEO of Osisko Gold Royalties Ltd.; and Randy Smallwood, CEO of Silver Wheaton Corp. Each finalists had 7 minutes to pitch and defend their idea on how to make the next major gold discovery in Val-d'Or, Québec. "The torch has been passed," noted Mining Titan Rob McEwen. "In 2001 the Goldcorp Challenge ignited the careers for the top 3 finishers, and I know that SGS Geostat will reap the benefits of winning the Gold Rush Challenge. Mark my words, this is not the last time we hear from the SGS Geostat team. I was fortunate to be part of the Gold Rush Challenge and I look forward to what Steve de Jong and his team at Integra Gold have planned next." Proceeds from the evening will go to a variety of Val-d'Or based charities. A video of the event will be posted on integragold.com in the coming days. The Data Miners. Vincent Dubé-Bourgeois (team captain), Antoine Caté, William Oswald, Fabien Rabayrol, Nathalie Schnitzler and Sarane Sterckx are geology students who are currently working on either their masters or PhDs in various fields. All members have experience in exploration from a variety of Canadian companies or Canadian/Provincial geological surveys, serving as either a junior geologist or consultant. The Goldcrushers. Affiliated with Corporate Geoscience Group (CGSG), Kwesi Appiah, Amanda Buckingham, Oliver Kreuzer (team captain), John Mortimer, Greg Walker, and Andy Wilde bring field experience from around the globe with different companies, leading mining, metal and hydrocarbon exploration and structural, generative and corporate geology efforts. With over 130 years of collective experience, they have a proven track record of delivering successful outcomes to clients, including involvement in many significant discoveries. GoldRX. Craig Hart, Director of the MRDRU since 2009, has more than 25 years of experience mapping and evaluating the regional geological settings of mineral districts in the Cordillera, mostly with the Yukon Geological Survey. Sara Jenkins, GIS Specialist at the MDRU, has been involved with the cartographic and data management aspects of mineral deposit research for the past 5 years, focusing primarily on projects throughout the Yukon, British Columbia, the Tethyan metallogenic belts, and South America. Paul Pearson. Paul boasts diverse practical structural geology experience throughout the Americas and Australasia with expertise in design and leadership of successful exploration programs for mineral and hydrocarbons in a wide range of geological environments. Paul is currently running an Australian-based global geology consultancy, Latin Global Structural Geology, integrating 3D structural geology with mineral resource models to provide shortcuts to discovery. SGS Geostat. Team captain Guy Desharnais and Jean-Philippe Paiement are exploration geologists and resource estimation experts. Doug Hatfield is a chemical engineer and geometallurgist with experience solving problems through machine learning techniques. Team members also included: Nicolas Babin, Claude Bisaillon, Yann Camus, Maxime Dupéré, Matthew Halliday Amanda Landriault, Lyne Maître, Patrick Perez and Nicolas Poupart. The Integra Gold Rush Challenge is an incentive prize challenge powered by the popular HeroX (www.herox.com) crowdsourcing platform. HeroX is a spin-off of XPRIZE, the leading organization solving the world's 'Grand Challenges' by creating and managing large-scale, high profile, incentivized prize competitions. After registering for the Challenge, challengers from any background or country were given access to an unprecedented database built from six terabytes and 75 years of historic mining and exploration data from Integra Gold's formerly producing Sigma/Lamaque mines in Val-d'Or, Québec. The individual or group whose submission represents the best prospect for the next big gold discovery on the Sigma/Lamaque properties, based on a weighted set of criteria as outlined in the Challenge rules (www.herox.com/IntegraGoldRush), wins their share of the C$1 million prize and a shot at notoriety. For more information: www.integragold.com/goldrush. Integra Gold is a junior gold exploration company advancing projects in Val-d'Or, Québec, one of the top mining jurisdictions in the world. The Company's primary focus is its high-grade Lamaque South project. In 2014, Integra completed the accretive acquisition of the Sigma Mill and Mine Complex, a fully permitted 2,200 ton per day mill and tailings facility. With major federal and provincial permits in place, existing infrastructure and exploration potential, this acquisition removed major costs and shortened timelines typically associated with mine projects. With a current market capitalization of $160 million, Integra has raised over $75 million since 2013 despite depressed gold prices. In February 2016, Eldorado Gold Corporation completed a strategic investment in Integra, acquiring 15% of the outstanding common shares. Integra was recently named to the TSX Venture top 50 performers in 2015 and the OTCQX Best 50 award for 2015. Cautionary Note Regarding Forward-Looking Statements: Certain disclosures in this release constitute forward-looking statements, including timing of completion of an updated resource estimate, timing of completion of an updated PEA and completion of the Sigma-Lamaque transaction. In making the forward-looking statements in this release, the Company has applied certain factors and assumptions that are based on the Company's current beliefs as well as assumptions made by and information currently available to the Company, including that the Company is able to obtain any government or other regulatory approvals, that the Company is able to procure personnel, equipment and supplies required for its exploration and development activities in sufficient quantities and on a timely basis and that actual results are consistent with management's expectations. Although the Company considers these assumptions to be reasonable based on information currently available to it, they may prove to be incorrect, and the forward-looking statements in this release are subject to numerous risks, uncertainties and other factors that may cause future results to differ materially from those expressed or implied in such forward-looking statements. Such risk factors include, among others, those matters identified in its continuous disclosure filings, including its most recently filed MD&A. Readers are cautioned not to place undue reliance on forward-looking statements. The Company does not intend, and expressly disclaims any intention or obligation to, update or revise any forward-looking statements whether as a result of new information, future events or otherwise, except as required by law.